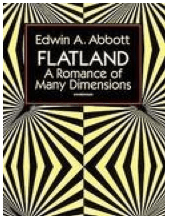 Many years ago I read a book called ‘Flatland: A Romance of Many Dimensions’ written in 1884 by the English schoolmaster Edwin Abbott Abbott. Although it was intended as a satirical comment on Victorian society, I found in it a powerful description of the interaction between different dimensions. Abbott’s Flatland is a world of only two dimensions, width and length but no height. Living on this 2D plane are various geometric beings such as squares, triangles and circles. Abbott describes how they would perceive each other only as lines. From their 2D perspective a triangle would appear as a straight line which appeared darker and denser in the middle. A circular being would also look like a straight line but it would also have a denser middle while each end would appear blurred and undefined. Do you get the picture? Above the plane of Flatland is a three dimensional being, a sphere. From his higher dimensionality he can see all of Flatland and he can also choose to intersect it at any point, even right inside one of its geometric residents. For as long as the sphere is above Flatland its beings cannot see it because they do not possess the dimension of height. However, the sphere decides to intersect Flatland. As he passes through it he is first perceived of as a single point. Then, as more of him intersects the 2D plane the residents see him as a line which grows wider and wider. 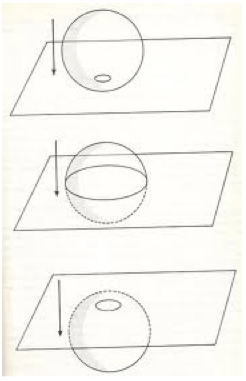 Once the spheres circumference has passed through Flatland he appears as a shrinking line, then a point, then nothing. We live in three dimensions of space, so if a higher dimensional being, like an angel, where to intersect our reality, it would most likely enter suddenly as a point of light, and then appear something like us. God the Son did not merely intersect our 3D world, instead He chose to incarnate as a human being. In Flatland terms that would be like the sphere becoming a circle and living on the 2D plane. Why would he do this? He would do this so that the residents of the lower-dimensional world would be able to see him, hear him, and relate to him. 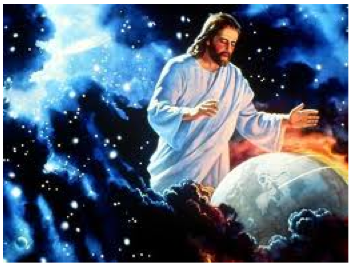 The Lord Jesus Christ, fully God and fully man, incarnated into our limited dimensions of space and time so that we could see Him, hear Him, and relate to Him. Of course He had another mission as well, and that was to pay the outstanding debt of sin by dying on the cross. You see, He needed to die as a man so that all who believe in Him could live in the higher dimensionality and timelessness of the Kingdom of God. During His short lifetime on Earth, the Kingdom of God equivalent of Flatland, Jesus presented the Godhead to humanity. He came to show Himself to us; He was, and still is, the image of the invisible God. As the residents of Flatland could not see the sphere until it entered their world, so humans could not see God until He entered our world. Jesus said, “No one has ever seen God, but God the One and Only, who is at the Father’s side, has made him known” (John 1:18). Jesus made visible what was previously invisible to us in the sense that He revealed to us God’s nature and character by displaying the values, priorities, and purposes of the Godhead. When Phillip, one of His disciples asked to see the Father, Jesus responded with, “don’t you know me, Phillip, even after I have been among you such a long time? Anyone who has seen me has seen the Father” (John 14:9). So here is the question; is there any other way that a human being can know God other than through Jesus? Jesus is the image of the invisible God. Jesus is the one who makes the Godhead known to us, and according to His own words, He is the only way a human can know God –”I am the way and the truth and the life. No one comes to the Father except through me” (John 14:6). We can know something about God from nature and religions but we can only KNOW God in and through the Lord Jesus Christ. I would be interested to hear from you if you have other ideas about how we can truly come to know God other than through a relationship with Jesus.